Edward Elgar was an English composer who received international recognition for his classical compositions. His most famous orchestral works include the Enigma Variations, the Pomp and Circumstances Marches (including Land of Hope and Glory), concertos for violin, and choral works such as The Dream of Gerontius. 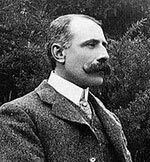 Edward Elgar was born 2 June 1857, near Worcester in England. His father was a music dealer, and he was able to teach himself the history of music, which complemented his music lessons in the piano and violin. He became a noted local violinist, playing in the Worcester and Birmingham festivals. Playing in a wind quarter he began arranging the music of Mozart, Beethoven and Handel; he gained a strong musical reputation within the local area, but it was not enough to make a comfortable living. Elgar was introverted and conscious of his ‘outsider’ background. He was Catholic and relatively poor, and so was outside the more established social background of British society. He was a keen cyclist and would enjoy cycling on his own into the countryside of Worcestershire. Elgar said that his trips into nature, inspired much of his music. In 1880, he began his first trips abroad, coming across the music of Richard Wagner. However, in this early period, Elgar’s hope for widespread acclaim and fortune were not met. In 1889, he married Alice Roberts, daughter of a Major-General in the army. She was older and from a higher social class. Her support both musically, emotional and financially played a significant role in nurturing the career of Elgar. Initially, after marriage, they move to London to be closer to the music scene of London; but the experience was difficult, and they ended up moving back to Great Malvern, where Elgar worked as a music teacher and composing music for festivals. In 1899, at the age of 42, Elgar finally achieved a big musical breakthrough with his first major orchestral work, the Enigma Variations. It was received to great critical acclaim and established Elgar as the pre-eminent composer of his generation. He also branched out into choral works, and his – The Dream of Gerontius is regarded as one of the greatest English choral pieces of all time. Elgar achieved even greater national recognition for his later Pomp and Circumstance Marches, which he composed between 1901 and 1930. To mark the coronation of King Edward VII, Elgar composed Land of Hope and Glory as a powerful finale to the Coronation Ode. It is one of the nation’s most popular pieces and is considered an unofficial national anthem. Following on from this triumph he was awarded a knighthood and special royal audiences. In 1904 Elgar and his family moved to Plas Gwyn, near Hereford, and they lived there until 1911. 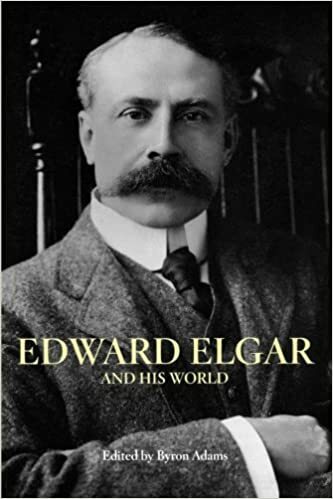 Elgar’s reputation abroad was as high, if not higher. His work was very well received in Germany and Central Europe. He also made successful tours of the US. “English music is white – it evades everything”. In the 1920s, his music fell out of popular appeal. Also, his beloved wife, Alice died in 1920. The shock of losing his wife discouraged him from making compositions in the 1920s. However, in the early 1930s, there was a revival of interest in Elgar’s music. The BBC organised a festival of his works to celebrate his 75th birthday. Towards the end of his life, Elgar achieved his lifelong ambition to be recognised as a great composer. His Land of Hope and Glory are always the grand finale to the BBC Proms series of classical music. Towards the end of his life, he made some gramophone recordings, becoming one of the first great classical composers to see the potential of recording music. Elgar died on 23 February 1934.